Today's other choice was 9 pots of flowers lined up on the other side of the pool...ugh...not so much... So I dipped into the archives to bring you along for another morning in the park. My OCD has me just dying to rearrange those ducks in the foreground, but when you're working with nine, you're just glad they showed up for the party! "Almost speechless" - that would be worrying. How you manage to entice nine wee critters to walk into your picture is beyond me! Lovely sunny shot. 4 squirrels and 5 ducks??? Amazing! I'm do jealous !!! 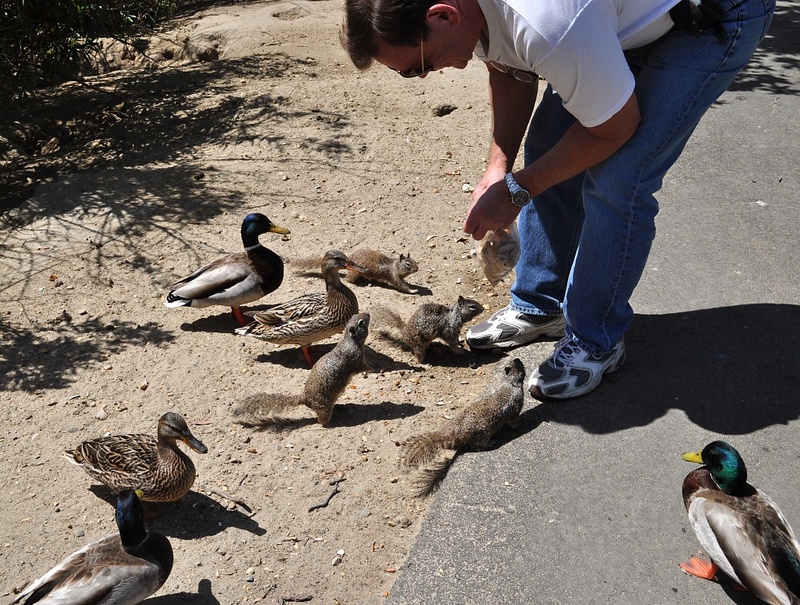 I wanna hang out with squirrels and ducks and be their buddy!!! Such a nice photo. You know what still amazes me in this is the fact that you have such a variety of animals that you are feeding at the same time. How do they all get along? How do they all share? Sure, they all know that they are getting fed and are begging. I mean seriously isn't this a lesson for all of mankind!!! Shouldn't all people just come together? I know that's probably too deep...as I was criticized for being, but I can't help it; I spend much of my time alone and with my thoughts. Oh....thankfully, you'd never be totally speechless! hehe! All the Dr. Doolittle references has the songs from that movie swirling around in my head (the original with Rex Harrison, not the remake). Wonder if I can find anyone willing to watch it with me (again... )? Great shot! You do have a way with animals Louise. I keep tell people about you 1 picture with the squirrel in the tree. i love these photos , love how animals interact with humans for food !!! but i always worry that some humans are not as nice as some , but thats just me i always thinking of 2 stories of the piture !!! Morning, Louise! (We're having morning coffee, just in case you can't smell it!) Another graet capture by the Squirrel Lady! Love that little guy standing on his hind legs! PS I want to sit on Jodie's veranda and eat lemon slices, too! you know those are some patient looking ducks! who knew? And finally, I am awake too. Good morning. I have the feeling half of this group is staying overnight at Louise's;-). Great picture for 9. I would have the squirrels, no ducks, but I could add some chipmunks. But where would I find the patience to feed them? 8:55 here on the east coast and all these people are up and posting already. I need to start getting up earlier. :-) Photos are posted and I haven't even begun to think about picking up the camera, having just read the paper and sipped my last bit of java. Now I feel like I am way behind. Nine? Nine? I had a thought but it required a dry day and it is raining. Okay, enough griping. I have never seen squirrels get that close to anyone. I imagine this isn't the first time they have come close to a human. Still, it is a great pic. Actually unbelievable. I am amazed. But then you seem to live in an area with a lot of nature's little creatures, having seen squirrels before as well as ducks and raccoons in your pics. I think that will be something I will add to my list of things to accomplish before this project is done. Photograph an animal. I have a couple pics of squirrels I took last year but that wouldn't count. And my list of things to accomplish before this is over is growing. LOL! This shot doesnt surprise me. You have that spirit. lovely picture of mr doolittle and the " following "
just looked at your daughter's shop boy you can see the wares already from the outside. would love to browse around in there. L. same question again did you get my e-mail with the video this timeof the littlehelper? Hilarious!!! Ducks AND squirrels!! Fun photo! You do get the "talk to the animals" vibe! A perfect number nine! I agree with Jodie, it's amazing you got nine ducks for this shot. LMAO!!! Too funny! I love the banter I find on 365. It is never a surprise when Sue or Louise or both are involved. I love this place!!! Definitely better than 9 pots of flowers, well done for getting them all in the pic. This photo illustrates one of my favorite activities. They look like extras in Snow White or maybe Shrek. I wonder if they are union or do they work for peanuts? I'm anticipating a shot where you or your husband are covered head to toe in squirrels and/or other wildlife, all straining toward the piece of food in your outstretched hand. Good job on #9. You have so many friends in the park. Great shot and really good to see the squirrels again. Haha, you almost have them in a neat and orderly line there! Cute shot. louise, how i wish i am the guy feeding these lovely little ones in the photo! my family used to go to the park after dark looking for possums (they are also adorable creatures) with some old bread in our hands, then we try to scatter the crumbs near the trees (where they live) and they will come scampering around! Luster's so right about the possums...I had to think for a minute, as ours, while "ok-cute" aren't what you'd call adorable. Then I remembered her Australian roots, and she's so right, the possums there are adorable, and from my encounters, as friendly as our squirrels! I have some fond memories...thanks for bringing up the subject Luster! on second thought..when you mentioned it, i could almost hear my friend disagreeing with me the other day, saying how she dislikes them for being so destructive....i only get to see them in the park and they're adorable, maybe only if they stay there....hahaha. Louise, yes it rained. Yesterday we had a little rain, but nothing like the storms of a month ago. I guess all the rain gave us the green grass. And I thank you so much for the kind words about my accomplishments. I must confess that my handyman accomplishments are less now than they used to be, due to my age and my back problems. And over the years I have learned my limitations. One more thing. What is up with the new profile pic? I saw it and didn't know it was Louise right away, because as you said you did, I look at the pic and not really at the name. :-) But then I go to your homepage and I see that it is your regular pic. Interesting. we just have little ground squirrels...how 'bout prairie dogs? I have never seen a duck and squirrel so close together! see i told you everybody loves you, even the animals! Great! The animals look very polite, like each one waiting to be fed. been out of town in AZ, had a lovely trip! Spring has burst into color there! Love the community of hungry critters captured in your pic! Now this a sight I've never seen. Squirrels almost eating out of your hand. Great picture. Sorry I missed the party. All work and no play makes for quite the boring woman. Love all the critters! Brad's comment had me laughing out loud literally. The mental picture is HILARIOUS!!! I think we may need to ask Peter to come up with something for this! He is sooo darn creative! aww! That is adorable! They seem very friendly... are they your pets or something? haha very cute.